Full bleeds are necessary whenever images, and backgrounds go to the edge of the page. Its recommended that we have 0.125" extra added to the edge of page. I.E a 6" x 4" postcard should be sized 6.25" x 4.25" before the finishing cuts. All the images and text should be with the "Safe Area" to ensure best results. All files sent to us must have their fonts converted to Outlines (a.k.a. Curves) in order for us to ensure proper results. There are thousands of fonts, and several issues of the same one in many instances. The popular typeface Helvetica has several issues as a font, the subtle differences in each can change a text layout as letter-spacing and widths may vary. The best option is to convert the font to vector outlines (see vector below) to preserve the integrity. Postcards, Business Cards, Flyers, Brochures etc. 350dpi is the recommended print resolution for these smaller items. The viewing range on these items is typically around 12" to 24" away and this resolution ensures crisp results. 120dpi is the recommended print resolution for larger media. Also files may be sent over with double the resolution at half the size, then scaled as necessary. Because of the increased viewing distance and rather large file sizes this resolution is recommened. 72ppi is the resolution used for all screen media. This isn't recommended for print resolution as its roughly a 1/5th typical print resolution. Additionally these images lose quality when scaled for larger media. A vector file is any image that's lines and styles are computed mathematically. These files are necessary for doing cut vinyl lettering, and highly reccommended for larger print file. These files are resolution independent and can be scaled as needed without loss of quality. 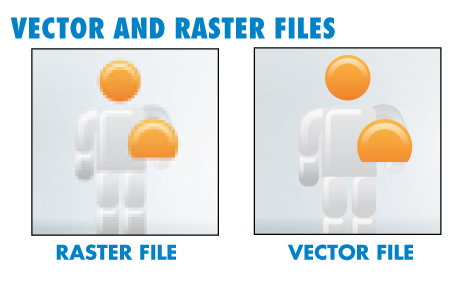 A Raster File is any image file. They're comprised of pixels and resolution dependent. 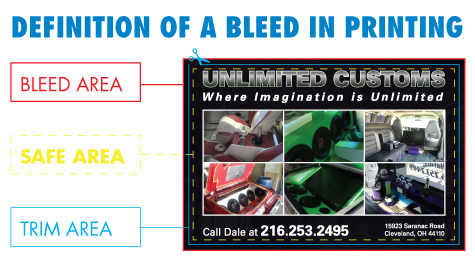 Typical Print quality is between 300dpi (dots per inch) and 400dpi and have CMYK color space. Images from the web are 72dpi and have RGB color space, as they are optimized for the screen and not print media. This color space is used for printing. For best results build your files in this colorspace. Any conversions from RGB to CMYK may have varying results because the CMYK colorspace is narrower. Typically when converted from RGB to CMYK blacks are built with all colors instead of just black, and color vibrancy may dull.